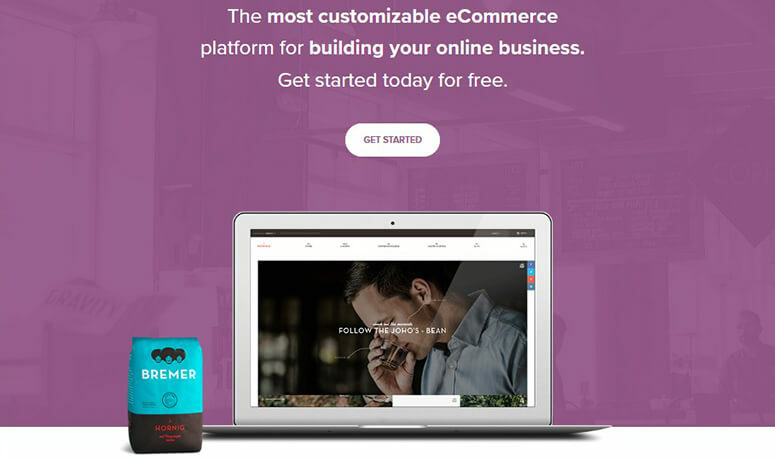 Looking for an eCommerce platform for your online store? Wondering which platform to select from Shopify and WooCommerce? Both of them are popular eCommerce platforms to create an online store. Choosing the correct eCommerce solution for your needs is vital for your business because it’s hard to back out from your original decision if it turns out to be a poor match. In this article, we’ll compare Shopify vs. WooCommerce so you can decide which platform is best for you. Shopify is a popular eCommerce platform that allows you to create an online store, receive payments from your clients, manage your products, and build a marketplace all in one. Shopify manages the web hosting, SSL certificate, web security, and every other aspect of your eCommerce experience. The features included with your online store will depend on the plan you purchase from Shopify. WooCommerce, on the other hand, is an eCommerce platform that works side-by-side with WordPress as a plugin. 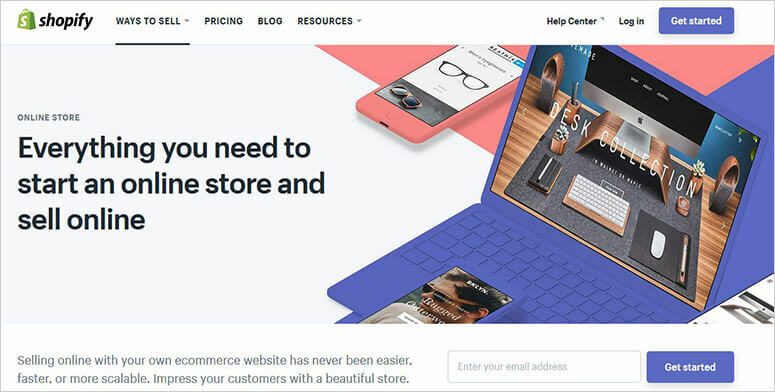 Since it’s built for WordPress, you can reap the benefits of creating a complete website for your online store using the best content management system (CMS) in the world. WooCommerce is an open source plugin, so you can customize your online store as much as you need to and there’ll be no limits in regard to adding features to your eCommerce site. 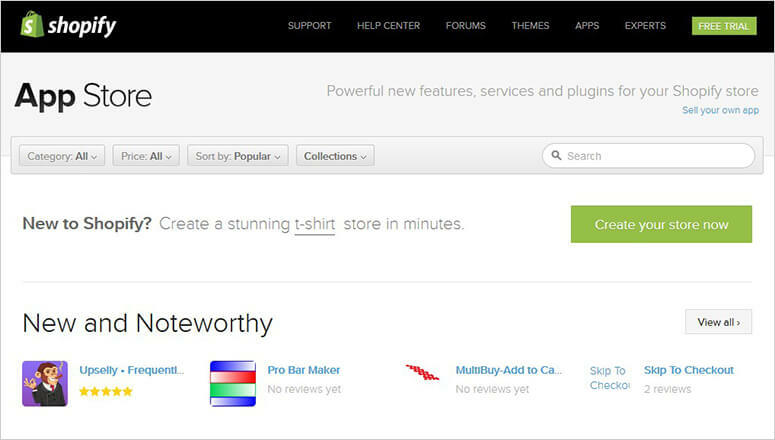 You can also use the top WordPress themes to style your online store. For features, you can always look into the best WordPress plugins to explore unlimited options for your eCommerce site. When creating an online store, you’ll want a simple and easy solution. An ideal platform is one that allows you to create your online shop on your own without having to hire a developer. Shopify is a one-window platform that deals everything for you like hosting, installation, updates, and management of your online store. Shopify goes out of its way to make sure that your eCommerce site is secure, compatible with all browsers, and mobile-friendly. Shopify also manages site performance, backups, and the loading speed of your online shop. You can simply sign up and select a template design for your online store, and you’ll be ready to roll. An online guide will help you with customization, adding products, and managing your sales. It has a drag and drop builder that assists you with adding products, manage reports, and customizing your store. You can also manage the sales and inventory for your website. Shopify comes with its own design and development tools which limit your control on the customization level. However, you can use the available addons from the Shopify marketplace to add features to your store. They have a huge collection of addons and design templates that allow you to create a beautiful online store. Shopify is an amazing platform for beginners to start with and it’s easy to use. WooCommerce is a WordPress plugin, which means you’ll need to create a WordPress site to install WooCommerce on it. You’ll need to update your online store manually and keep your WordPress website secure from hackers. Since it works with WordPress, you can use plugins to handle these tasks for you. With WooCommerce, you can customize your store to add unlimited features. On top of that, you can also use over 50,000 WordPress plugins to add any functionality you could ever desire on your site. The downside of WooCommerce is that there’s no default drag and drop builder to design your site. However, you can use WordPress plugins like Beaver Builder or the Divi Theme to add a website builder functionality to your online store. These plugins will add to the overall cost of making your eCommerce site. Though there is a setup wizard for everything you need to do on WooCommerce, it’s still somewhat overwhelming due to the unlimited options and flexibility it offers to you. This makes the onboarding process difficult when you compare it with Shopify. The Winner: Shopify is a winner here. It focuses on beginner users who’re just starting their online business. WooCommerce is highly flexible but has a bit of a learning curve to master fully. In the initial stages of beginning an online business, you’ll need to start with a platform that offers all the features you need at a low cost. There’s a cost up front for the main software or eCommerce platform that you choose, and then the cost for its addons and services that are necessary to create your online store. 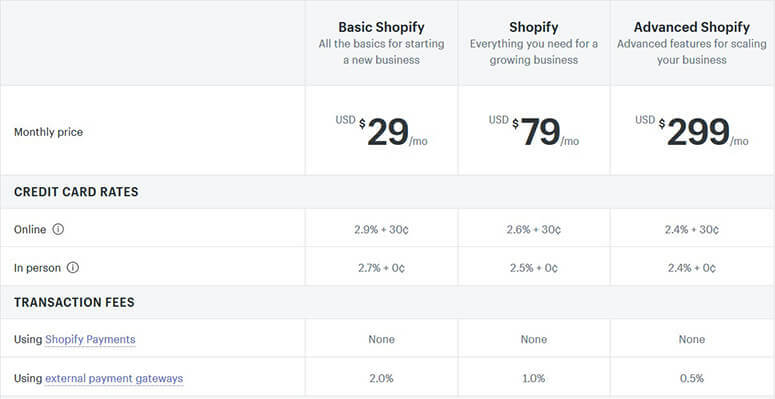 Shopify comes with multiple plans starting from $29 per month and going up to $299 per month. Each of these plans has their options displayed on the Shopify site. You can choose the Basic Shopify plan to start your online store and upgrade to other premium plans as your business grows. All plans come with a domain name, an SSL certificate, and web hosting for your eCommerce site. When starting your business with the Basic Shopify plan, you’ll get unlimited file storage space, 2 user accounts to manage your online store, options to add unlimited products, 24/7 support, and more. The Basic plan charges you for adding third-party extensions and tools on your site. You’ll end up paying more money for using addons that are needed to scale your online store. Another factor that adds to the cost is the payment solution. Shopify comes with a default payment gateway (Shopify Payments) that charges 2.9% + 30 cents on each transaction in your online store. You can always use a third-party payment solution. However, Shopify will charge 2.0% flat fee on all transactions from a third-party solution. If you choose the Advanced Shopify plan, you’ll need to pay 0.5% per transaction, but this plan itself costs $299 per month. In the initial stage, you can use Shopify Payments which is the default solution and relatively same as other platforms like Stripe and Braintree. WooCommerce is an open source platform and one of the top WordPress eCommerce plugins. You can download it for free from WordPress.org repository. You should check out this comparison between WordPress.com vs. WordPress.org if you need information regarding the two WordPress ‘flavors’. To get started with WooCommerce, you’ll need to purchase a domain name, an SSL certificate, and a web hosting account. Normally, a domain name, an SSL certificate, and web hosting costs $13.99 / month. That can feel like a lot of cash if you’re just starting out. Fortunately, the technology has advanced and there are now specific WooCommerce hosting companies that cut down on your initial cost. We recommend Bluehost for hosting for your online store. It’s also recommended by the WordPress core and WooCommerce officials. Bluehost agreed to offer our users a free domain name, a free SSL certificate, and a huge discount on web hosting. After accepting this offer, you’ll only need to pay $6.95 / month, which is much more affordable for new online shop owners. If you compare the initial cost of Shopify vs. WooCommerce, then WooCommerce is quite a bargain. There’s no transaction fees with WooCommerce, which means you don’t need to share your profit on sales and you can earn good money from your shop. 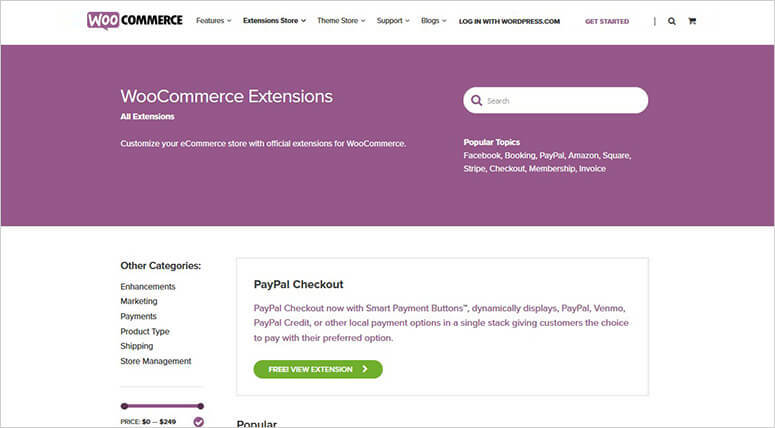 On the negative side, WooCommerce premium extensions are expensive and you need to pay a hefty amount to add special features to your online store. The good news is, you may find a free alternative for every paid solution in WordPress’ plugins repository. Another cost-saving factor is that you have the option to only buy the tools and addons that are necessary for your online store. WooCommerce lets you pick and choose your features according to your specific needs. The Winner: WooCommerce is the clear winner as it saves you money to the maximum level. With the support from WordPress, it beats Shopify easily in terms of free addons and third-party tools. No fees on transactions is also a massive ‘win’ factor for WooCommerce. Both Shopify and WooCommerce have tons of payment solutions that make it easy for you to receive payments from your customers. It’s recommended that you add multiple payment methods that are suitable for you to collect payments, and also available for your clients to make payments in your store. On Shopify, there’s a default payment option known as Shopify Payments (powered by Stripe) that you can use to accept payments from your customers. It allows you to integrate many other payment solutions easily. The big downside of Shopify is that you need to pay them an additional 2.0% transaction fee on each transaction. This cost is in addition to the default cost that is deducted by the third-party service you’re using on your site. However, if you are using the Advanced Shopify plan, then you need to pay 0.5% per transaction; but this plan costs $299 per month which is grossly expensive. Their default payment gateway, Shopify Payments, has no transaction fees. Though a basic credit card fee will be charged on every transaction. Shopify has their own credit card rates that start from 2.9% + 30 cents on each transaction. When you upgrade to a bigger plan, the transaction cost reduces automatically. 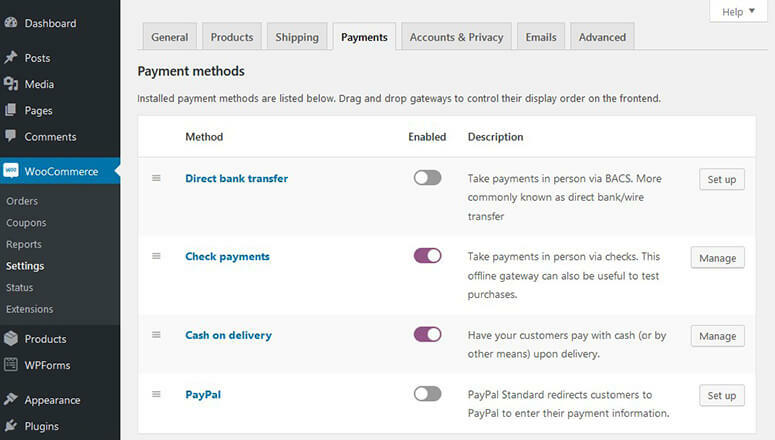 By default, WooCommerce integrates Paypal and Stripe payment gateways. However, you can add any payment solution to your WooCommerce store easily using addons and WordPress plugins. WordPress plugins also make it easy to use thousands of regional payment solutions on your site, which means you can ask for a payment service and there’s a fair chance that it’ll be available as a plugin. You can also create your own custom payment solutions and add them to your online shop. WooCommerce never charges a single penny on any transaction. You’ll only need to pay the default fees for the third-party solutions you’re using to accept online payments. That way, you can keep what you earn. Large online stores using a third-party payment service can use WooCommerce and save a lot of money thanks to having no transaction fees. However, if you’re a startup and want to use Shopify to create your online store, then their default payment gateway has the lowest initial cost. The Winner: It’s a tie. Both Shopify and WooCommerce have tons of options for payment solutions and they can be altered depending on the requirements of your online store. You can use any eCommerce platform to create your online store, but it won’t be a complete solution without the help of addons and extensions. Sooner or later, you’ll need to add more features to your site, and that’s where addons come into play. Some of these addons include email marketing services, lead generation tools, SEO tools, analytics solutions, customer support software, and more. Whether you are using Shopify or WooCommerce, you can add tons of third-party addons and tools to your online store to take your site to the next level. Shopify has an App Store that’s similar to Google Play for Android phones. You can download and install any app from the Shopify App store to add it as a feature on your online shop. There’re hundreds of thousands of apps available in the Shopify App store. It also allows you to use the API key of any addon to integrate it with Shopify. A great example of a lead generation tool is OptinMonster. It’s the most popular email marketing tool that helps you build an email list and reduce cart abandonment. Their apps are powerful to help you manage SEO, reviews, coupon codes, countdowns, and more. You can use free and premium addons from the Shopify store to add features and functionalities on your site. The free apps integrate with your store through API keys, and the premium apps come with monthly and yearly subscriptions. WooCommerce is a WordPress plugin which makes it flexible. It works easily with the other 50,000 free plugins from WordPress. It also integrates easily with premium WordPress plugins. It’s easy to use these plugins to add amazing features to your online store like payment solutions, SEO and analytics solutions, speed optimization tools, content tools, product review addons, and a lot more. As your business grows, you can hire an in-house development team to create custom plugins and extensions to integrate with WooCommerce. That way, you can easily add any functionality on your eCommerce site without any hassle. The Winner: WooCommerce is the winner. We tried adding custom apps on Shopify and it’s extremely difficult. However, WooCommerce integrates easily with any custom plugins and you can also upload your own custom addons through WordPress. Being an open source software, the flexibility it offers is incomparable. Any business, whether it’s online or not, grows with time. With the growth comes new challenges and you need more resources to help you manage the business. Both Shopify and WooCommerce were built to handle heavy traffic sites and unlimited customer orders. However, there’s always differences to consider in the platform you choose to create your online store. You’ll need a platform that allows you to scale your business smoothly. Shopify is a simple platform that helps you start your online business with their Basic plan. When your business grows, you can upgrade to a plan with more options and features. The best part of Shopify is that you don’t need to manage updates, security, or the performance of your online store. You can rely on Shopify for your growing business as they take care of your uptime, website backups, speed optimization, and more. If you want to be extra careful about your online store, then you can use their enterprise service that comes with Shopify’s Plus plan. These Shopify plans are expensive but they reduce the work on your part and you can focus solely on your business’ growth. You also don’t need to hire a team to manage your site, which means no additional costs to build a proper set up for website management. However, you’ll need to plan long term growth to cover the expenses you’re paying to Shopify every month. WooCommerce is totally different in terms of site management. It’s a self-hosted platform and you’ll need to manage everything on your own including website updates, backups, security, and more. However, WooCommerce is extremely flexible, so you can easily manage the growth of your online store. You’ll also have the full control of managing your resources, adding only the paid extensions you’ll actually need and use on your site. As your traffic grows, you’ll also need to upgrade your hosting plan to survive the upward scalability. 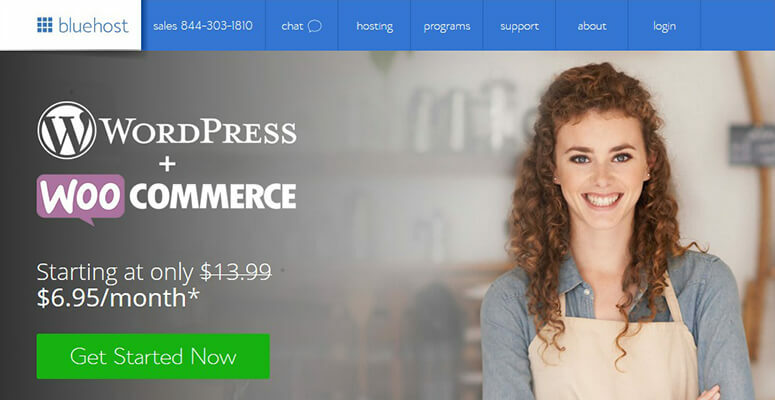 Sometimes the hosting cost increases a lot, and you’ll have to look for other WordPress hosting providers like WP Engine or LiquidWeb to get managed hosting for your WooCommerce site. The Winner: Shopify is the winner here as it’s easy to scale your online store with them. However, if you need flexibility and are willing to pay for managed web hosting, then you should consider using WooCommerce. We have compared the cost, ease of use, payment solutions, and more for these two eCommerce platforms. Overall, it totally depends on your usage and requirements. Shopify and WooCommerce both stands out in different areas. Here are the key points from the above comparison to help you decide which platform to choose between Shopify and WooCommerce. It’s easy to start and user-friendly. You don’t need to manage your online store at all. You can use a default payment solution or add a third-party solution. Easy to scale your website when needed. You don’t have full control of your online store. Transaction fees can reduce your profits on sales. You’ll need to select a plan to upgrade in Shopify. There’s no flexibility to choose only features that you need. If you’re looking for a solution that needs no management on your end that you can scale easily when your business grows, then you should select Shopify to create your online store. It’s an open source software and integrates any custom addons you desire. You’ll have full control of your site. The initial cost is cheap to set up your online store. There are WooCommerce-specific hosting companies that cut down your cost on web hosting. You’ll have to manage your site on your own, and that includes updates, backups, security, and more. You’ll need to learn the software fully because it has unlimited features, and that can be overwhelming if you don’t know exactly what you’re looking for. The scalability costs can eat into your budget. If you want to start at a lower cost and need full control to manage your eCommerce site, then WooCommerce is an amazing platform for you. You’d also like to check out this article on BigCommerce vs WooCommerce. We hope this guide helped you compare Shopify vs. WooCommerce and you’re able to select the best platform for your needs. You may also want to check out our step-by-step tutorial on how to create an online store.